We support artisans, farmers and lovers of cheese. We source our wheels from five producers that we know personally. 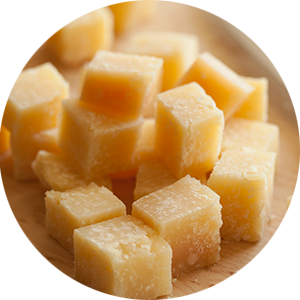 Parmigiano Reggiano® is made with raw milk — using the same traditional methods that were 'round since the world was flat — and aged at least 24 months for intense, complex flavors. Nutty, sweet, grassy, creamy, fruity. Nothing compares to The King of Cheeses. 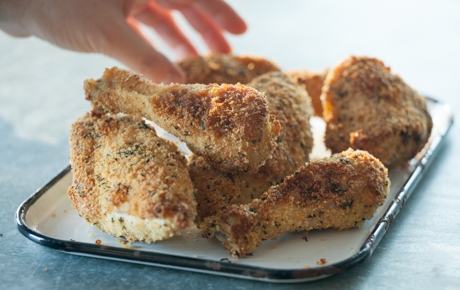 Serve with dried fruit or fig jam, and provide Aceto Balsamico di Modena or honey for dipping. 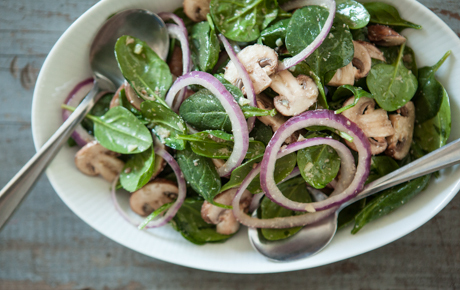 Use a cheese plane or vegetable peeler to shave off ribbons and serve over salads. The large surface area of the ribbons gives high flavor impact. 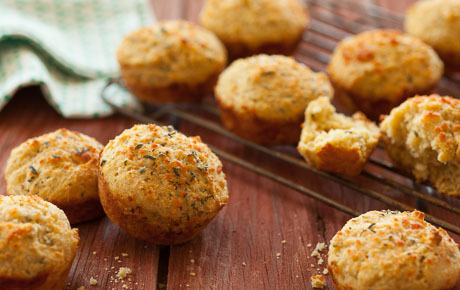 Sprinkle over finished dishes for a burst of rich flavor, incorporate into breadcrumb mixtures or stir into ravioli fillings. Add leftover sections of rind into soups or stews to infuse broth with umami flavor, or steep in cream for sauces. Take a closer look at a whole wheel of Parmigiano Reggiano in our stores. Each wheel carries proof of its authenticity. During production, the future rind is impressed with the number of the "caseificio" or cheese house, production date and pin dots forming the words "Parmigiano Reggiano." The pin dots guarantee that the cheese was made under regulation of the Consorzio del Formaggio Parmigiano Reggiano, conforming to its stringent standards of quality. After one year of aging, each wheel that passes the test is branded with an oval certification mark and left to finish aging. Almost every piece we cut includes part of the marked rind, so you can verify it is the wheel thing, Parmigiano Reggiano! The four-digit number above the stamp traces back to the province responsible for the cheese. 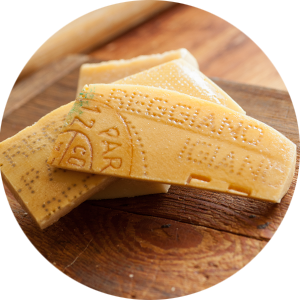 Once the Consorzio has inspected the wheel and evaluated for color, texture, aroma and quality, the round stamp that says “Parmigiano Reggiano” represents the seal of approval. 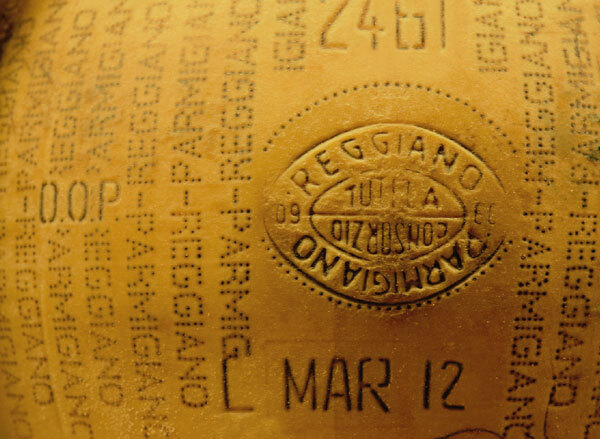 Underneath the Consorzio approval stamp is the month and year that the cheese was produced. 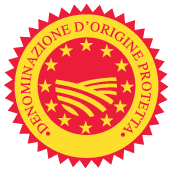 Short for “Denominazione di Origine Protetta,” (in English, PDO/Protected Designation of Origin) this affirms that the wheel was produced using the correct methods within the approved regions. Can you read “Parmigiano Reggiano” in dots all over the rind? It’s another sign that you’ve got the real thing! With all the Parmigiano Reggiano found in the market, you might wonder what makes ours at Whole Foods Market different. Honestly, we have a true passion for Parmigiano Reggiano! Each year we visit the region and select wheels based on the flavor profile we believe is best, buying from just a handful of producers that we know personally. First we choose cheese made with the season's best milk—fall and spring when grass is most flavorful. Then our chosen wheels are carefully aged and hand tended for a full two years to bring out the desirable "pleasant fireworks" on the tongue. In a world of mass-produced food products, we are proud to offer a true hand-crafted work of art. Don't stop at grating! This time-tested, complex cheese is magnificent served on its own. Break off small chunks, create paper-thin slivers or cut into bite-size slices. Taste it as you would a perfectly ripe Brie or Stilton, savoring its nuances. Enjoy its delightful range of flavors and textures: nutty, sweet, grassy, creamy, grainy, fruity. 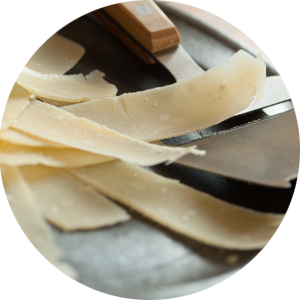 Everyone loves Parmigiano Reggiano, so not only can you serve it alone, you can pair it with a long list of other flavors that highlight its subtle bite and sweetness. Our favorite? Thin shavings of Parmigiano Reggiano on a bed of spicy arugula dressed with extra virgin olive oil and aged balsamic vinegar. Try it also with honey-drizzled pears, stirred into a creamy risotto or as a real treat on eggs with shaved truffles. And, of course, the flavor duo of Parmigiano Reggiano and tomato sauce is one of the most satisfying combinations in food history. When it comes to wine, bring out the full potential of the cheese by serving it with light- to medium-bodied Reds such as Chianti, Valpolicella or Lambrusco, as well as Prosecco and other sparkling Whites. Wedges: Buy pieces that will last you just a week or two. Exposure to air causes the cheese to dry out and lose flavor, so keep it tightly wrapped in parchment paper or aluminum foil. Store in the cheese or veggie drawer of your refrigerator (40°F); freezing destroys its subtle nuances. 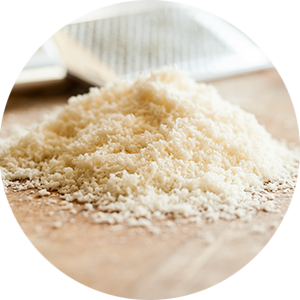 Grated: For maximum flavor and aroma, grate your own Parmigiano Reggiano directly onto food or buy it already grated as close as possible to when you plan to use it. Store pre-grated cheese in the refrigerator in a zip bag with all air squeezed out. Like an old-world cheese shop, the cheese department at Whole Foods Market is renowned for excellence and service. Our team members are proud of the huge selection of high-quality cheeses they have to offer and passionate about sharing their knowledge. They love to help you make the best choices, whether it's for a party platter, wine pairing or a simple meal of quality. Stop by for a taste! 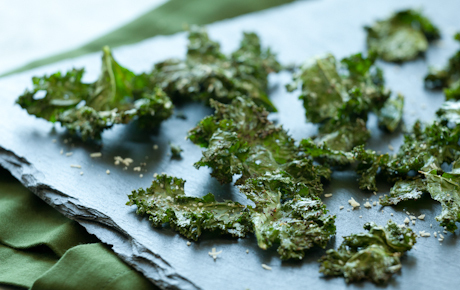 These savory crisps are simple and irresistible, made from just two ingredients. For a little heat, add a pinch of cayenne or ground black pepper to the mixture before baking, if you like. 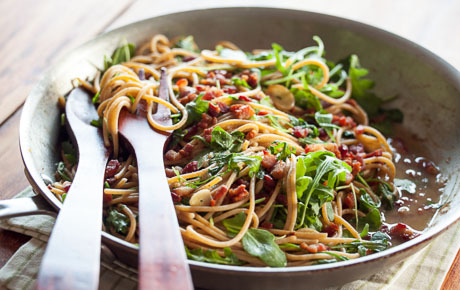 Serve alongside soups and salads or as a savory bite with cocktails. Preheat the oven to 300°F. Line 2 baking sheets with parchment paper or silicone baking mats. Bake until slightly browned on top, 8 to 12 minutes. Remove from the oven and cool a few minutes to let crisps firm up. Slide parchment paper off the baking sheet and onto a wire rack. Use a spatula to gently loosen crisps. They should be slightly flexible at this point, but will harden as they finish cooling. Repeat process with remaining cheese mixture. Allow crisps to cool completely. Store in an airtight container for up to 3 days. Alternatively, on a parchment-paper-lined plate, microwave the cheese using the same method. Cook at 50% power for 30 seconds or until flattened and crunchy. The rind of a Parmigiano Reggiano wheel, though chewy, is completely edible. So when you get down to the end, toss it into simmering soup, stew or pasta sauce. After it softens, remove, dice and return the bits to the pot. Many who taste Parmigiano Reggiano assume its subtle crystal-like texture comes from salt, but in fact, it is due to protein crystals that form when amino acids break down during the aging process. The longer the cheese ages, the more lovely "crystal" crunch to enjoy. Professional cheese testers (battitores) "listen" to each wheel of Parmigiano Reggiano by placing the 85-pound wheel on a special stand and gently tapping it with a small "martello" or hammer to detect flaws in texture and structure. They are also experts at evaluating the color, aroma and maturation of the cheese—all without breaking it open.